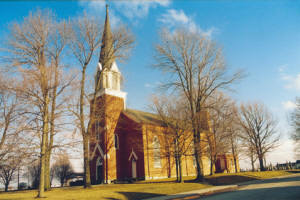 St. Joe Church is northeast of Ft. Recovery, located 1/2 mile north of 119 at the corner of Sawmill Road and St. Joe Road. 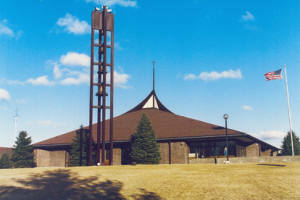 St. Joseph Parish was established in late 1839 when a log church was built. Joseph Doll donated to the bishop an 80 acre tract of land, which the church was built upon. Many of the early families from St. Joseph came from the Archduchy of Baden, Germany. In the early years St. Joseph was served by diocesan priests on an irregular basis. After 1851 priests of the Society of the Precious Blood served the parish. Until 1881 these priests came from the Himmelgarten Convent, which was over three miles to the east of St. Joseph. From 1882-1905 priests came from a mission house in Ft. Recovery. In 1906 the present rectory was built and until 1984 the parish had a resident pastor. 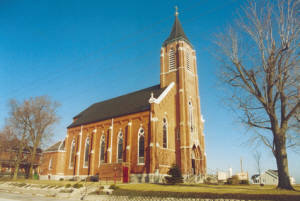 The present brick church was erected in 1861. 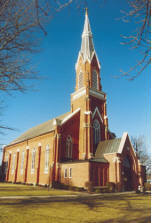 A tower and entrance was then added in 1902 and the church was enlarged and the interior remodeled from 1918-1920. Changes have been made throughout the years including a redecorating project in 1978. Then again in 1999 a restoration project began to see if it was possible to recover the painted canvas of St. Joseph on the ceiling. It needed some repair, but is now visible by those who visit or attend mass. St. Joseph & St. Peter became the first parishes in the area to share a priest in 1984. Then again in 1999, we were to add another parish to our cluster with St. Anthony joining. That changed again in 2004 when the cluster grew into the four present parishes in 2004 consisting of: St. Joseph, St. Peter, St. Paul and Mary Help of Christians, with one Pastor and an Associate Pastor.